Download "Scorpio NRG CR & PS. 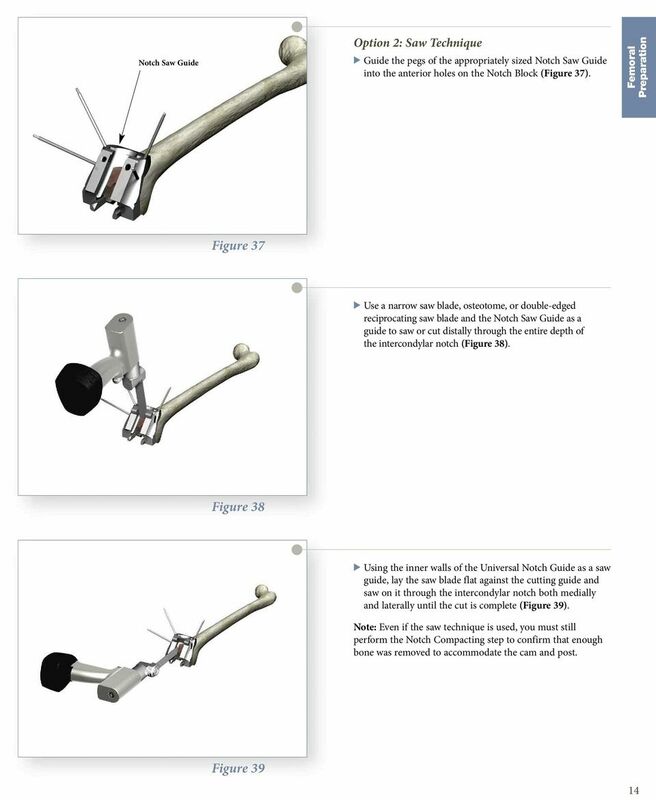 Single Radius Primary Knee System Surgical Protocol. 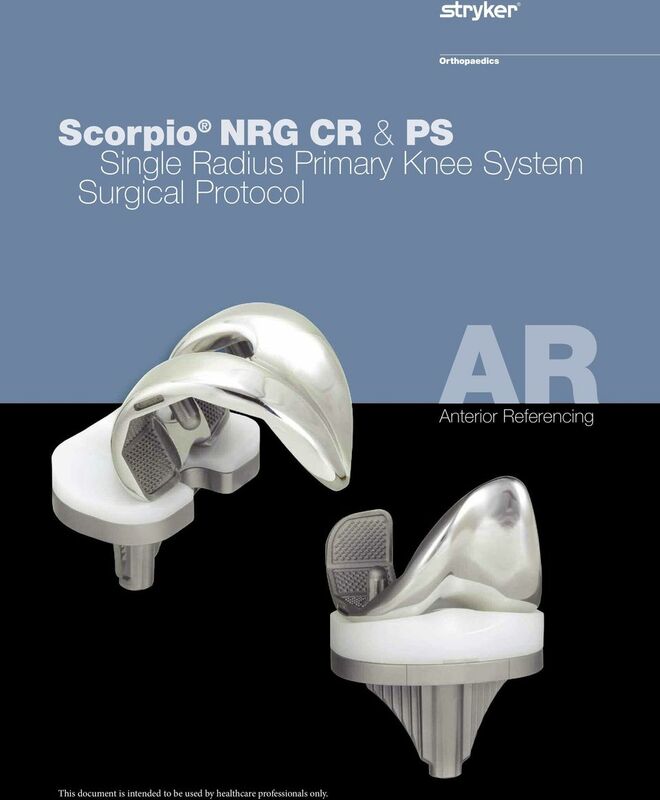 Anterior Referencing"
1 Scorpio NRG CR & PS Single Radius Primary Knee System Surgical Protocol AR Anterior Referencing This document is intended to be used by healthcare professionals only. 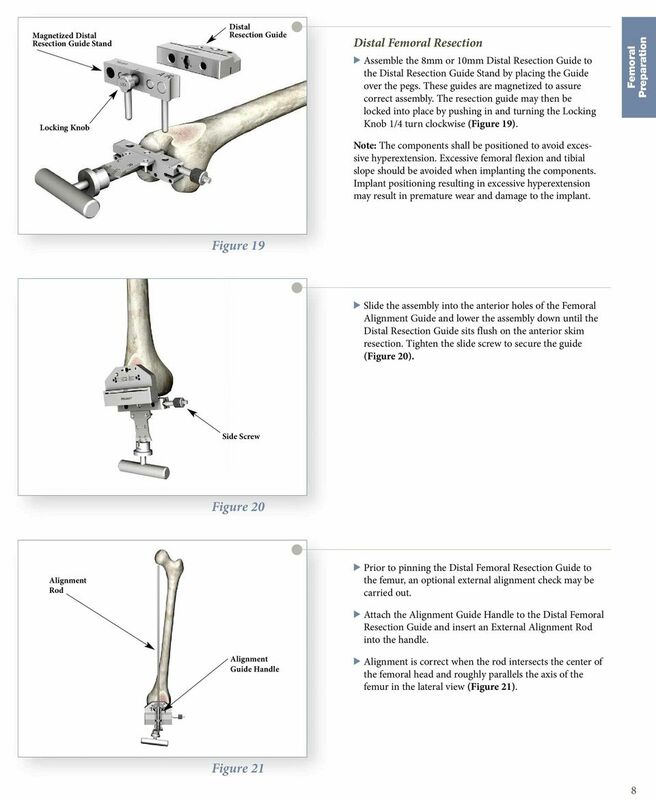 12 Scorpio NRG AR Single Radius Primary Knee System Surgical Protocol Femoral Anterior Cortex Anterior Chamfer > Complete the remaining four femoral bone resections. (Figure 28) The order of the resection is critical. > The sequence is: 1. posterior condyles 2. posterior chamfer 3. anterior cortex 4. anterior chamfer Notch for Scorpio PS Only Posterior C ondyles Posterior Chamfer Figure 28 > The Scorpio Universal Block Instrument is used after completion of the five femoral bone cuts. > Select the appropriately sized Universal Notch Block. The block sits on the anterior, anterior chamfer and distal cuts. The anterior geometry represents the left and right lateral flanges of the implant of the same size. The sides are marked LL and RL for left lateral and right lateral, respectively. > Position the Notch Block on the prepared distal femur, aligning the lugs with the holes made by the Femoral Cutting Guide. 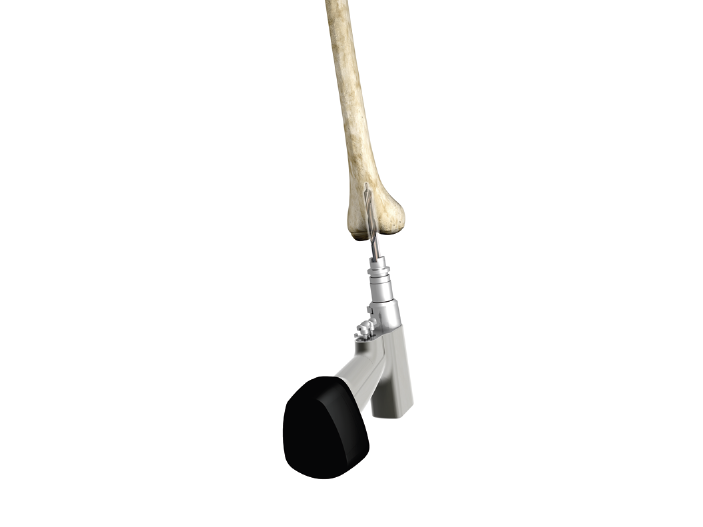 Tap into place with the mallet (Figure 29). To further aid the positioning, if using pegless blocks, note that the block is also the same width as the implant of its respective size. Scorpio Universal Notch Block Figure 29 Note: Pins used with the size 3, 4 and 5 Notch Blocks should be used with no more than one pin per side to avoid the potential for the pins intersecting with each other. Pins should be used on the contra-lateral side from each other. (e.g.) If a pin is placed through the medial anterior chamfer hole, a second pin should only be placed on the lateral side through either the chamfer or anterior flange hole. Towel clamps may be used for additional stability if necessary in the indicated holes on the distal plane. 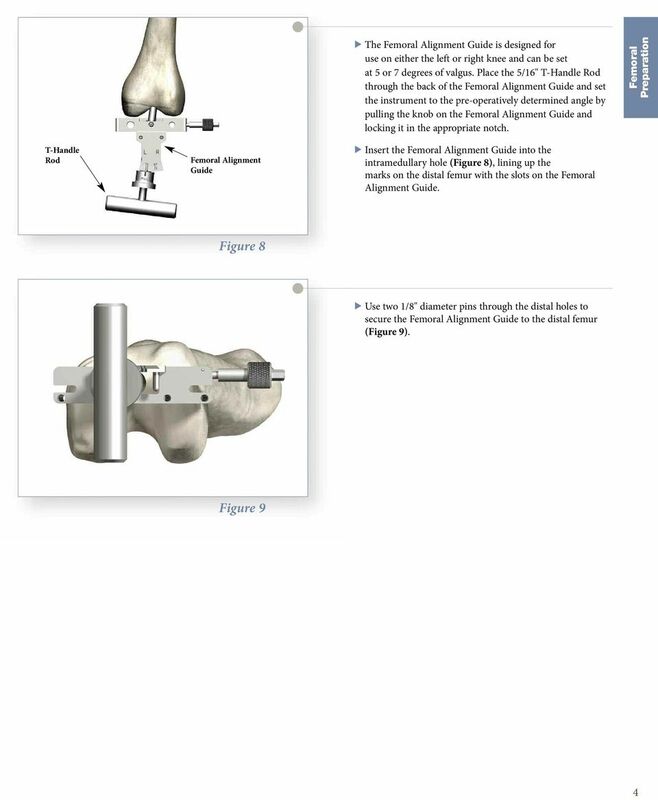 > Once the Notch Block is seated flush against the anterior, anterior chamfer and distal cuts of the femur, drill 1/8" headless pins through the angled holes ( X ) on the anterior and/or anterior chamfer surfaces of the block (there are 4 X holes each at 15 ) (Figure 30). 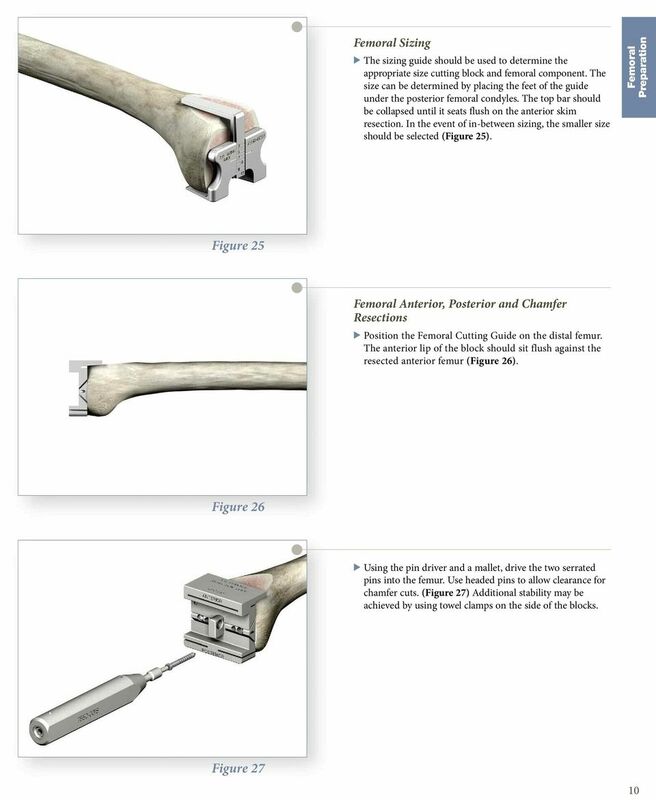 > Towel clamps may be used on the medial and lateral sides of the distal portion of the block. It is recommended to use at least the 2 anterior pin holes, even if towel clamps are used. 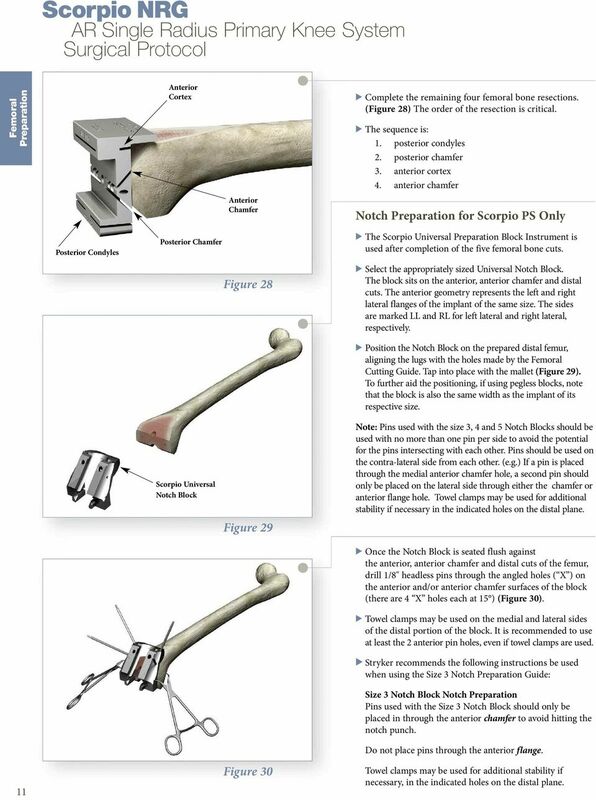 > Stryker recommends the following instructions be used when using the Size 3 Notch Guide: Size 3 Notch Block Notch Pins used with the Size 3 Notch Block should only be placed in through the anterior chamfer to avoid hitting the notch punch. Do not place pins through the anterior flange. 11 Figure 30 Towel clamps may be used for additional stability if necessary, in the indicated holes on the distal plane. 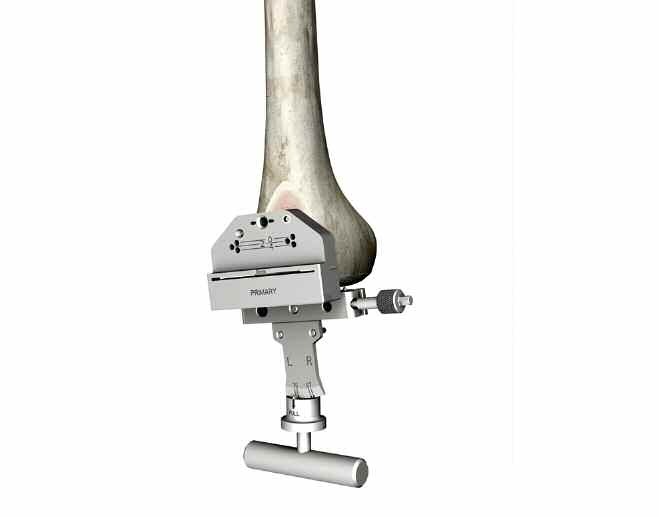 20 Scorpio NRG AR Single Radius Primary Knee System Surgical Protocol 2mm Resection Stylus Resection Guide > The Xcelerate System offers two styli each having two resection levels; 2mm and 8mm. 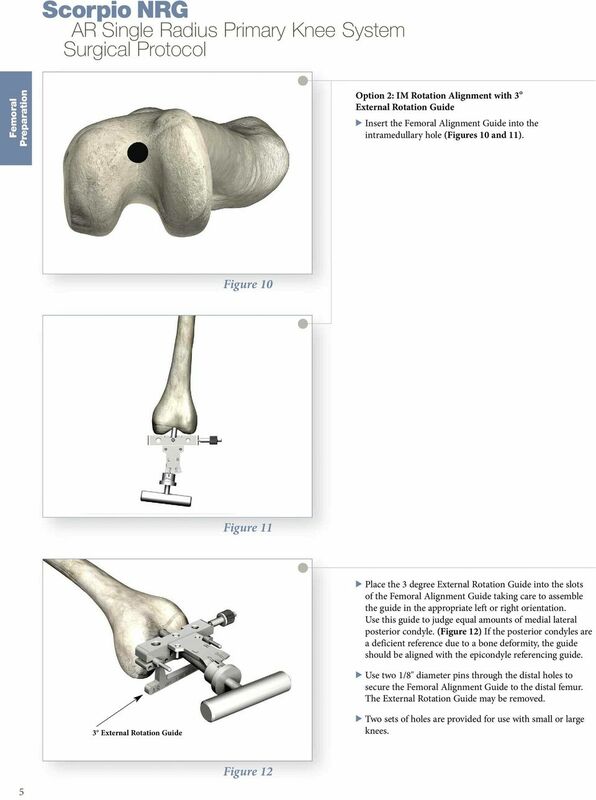 > The settings allow for a corresponding resection of bone below the point of the stylus (i.e. the 2mm setting allows for a 2mm resection below the point of the stylus) (Figures 51 and 52). 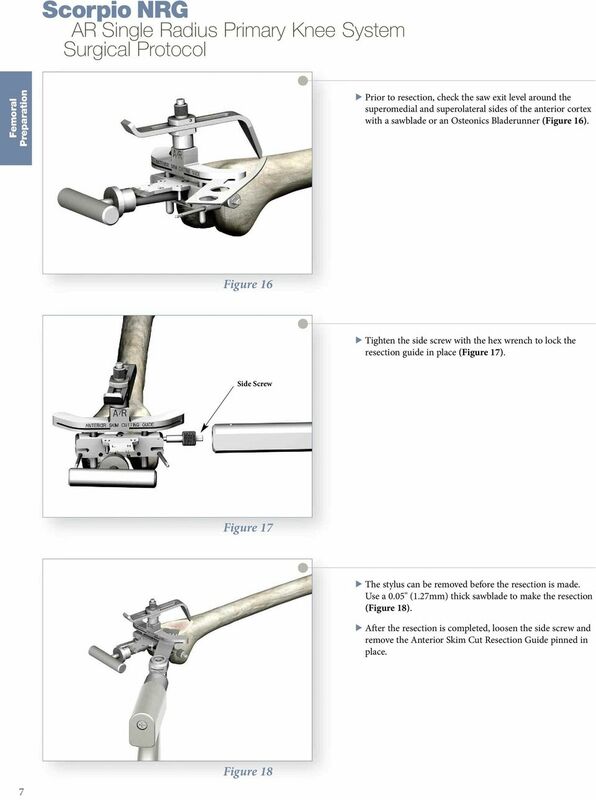 External Alignment Guide Figure 51 8 mm Resection Stylus > Once the resection level is established, tighten the thumbscrew on the Resection Guide. The Stylus is removed by depressing the button and pulling it out. 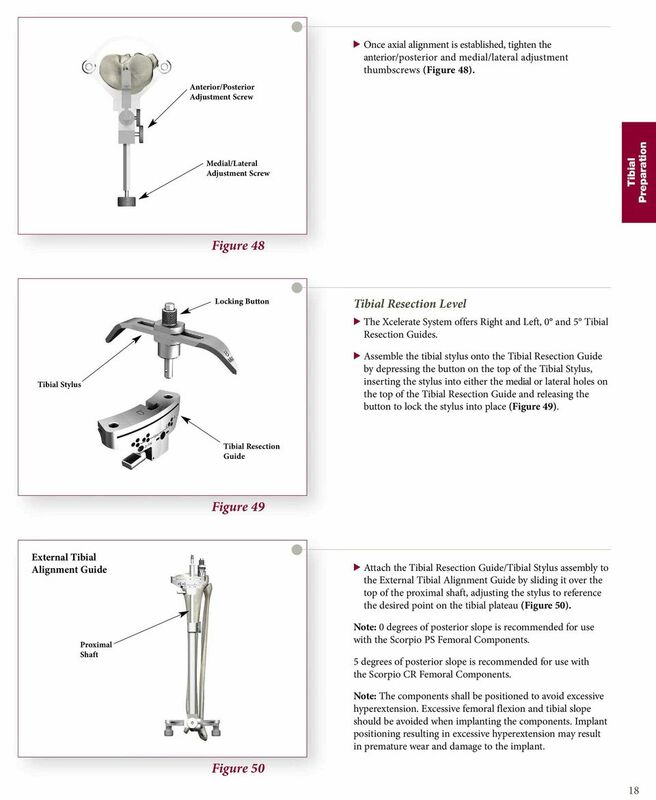 Resection Guide External Alignment Guide Figure Resection Guide Vertical Thumbscrew Slide Proximal Shaft up through Resection Guide Figure 53 Proximal Tibia Resection > Secure the Resection Guide to the proximal tibia using two 1/8" drill pins, drilling through the 0 holes. 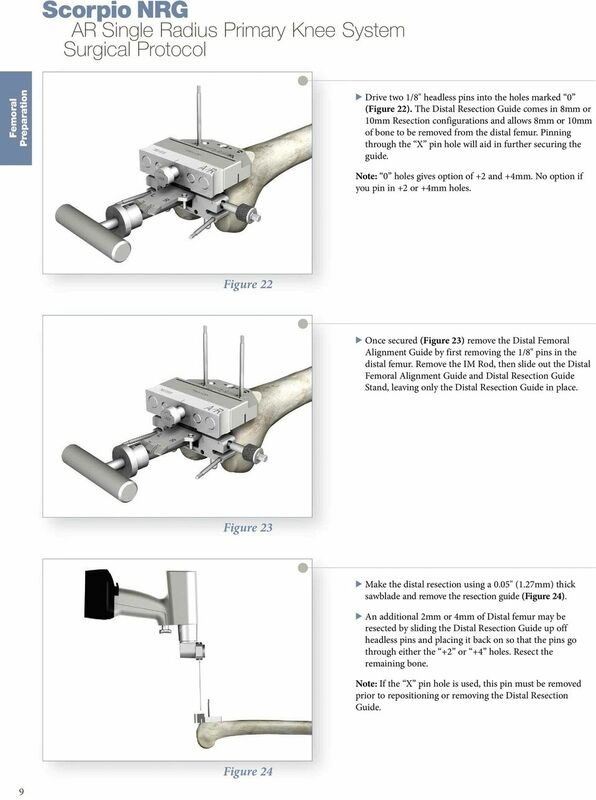 > Loosen the thumbscrew that holds the Resection Guide to the External Alignment Guide. > Loosen the vertical adjustment thumbscrew on the shaft of the alignment guide. 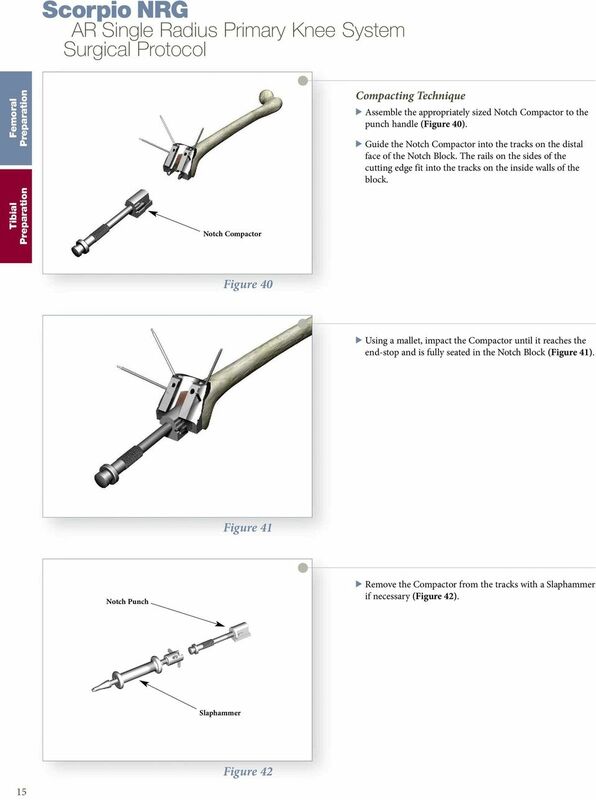 > Using the Slaphammer, extract the two headed fixation pins on the top of the alignment guide from the proximal tibia. 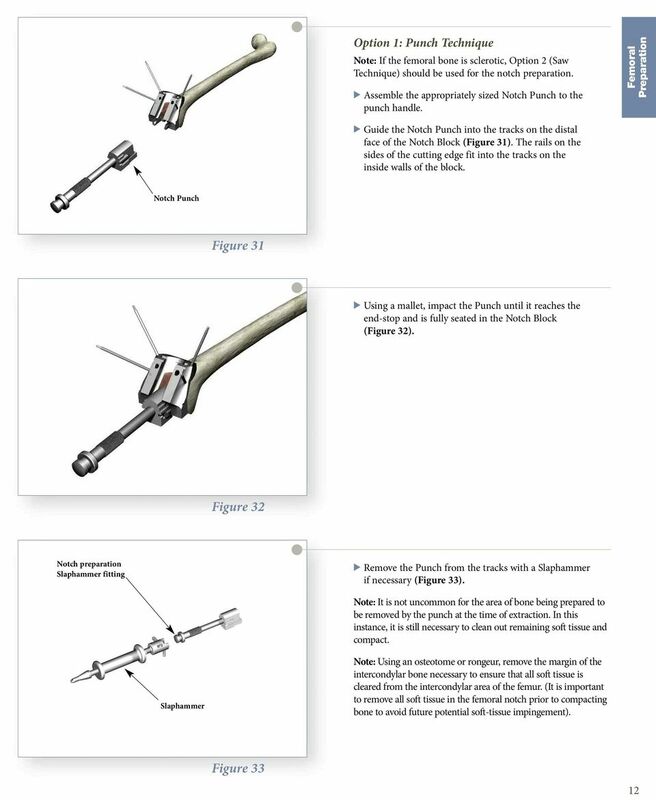 > Remove the proximal shaft of the alignment guide by sliding it up through the top of the resection guide (Figure 53). 24 Scorpio NRG AR Single Radius Primary Knee System Surgical Protocol Locking Knob 1 Alignment Rod Alignment Handle > If varus/valgus adjustment is needed, Locking Knob 1 is loosened. 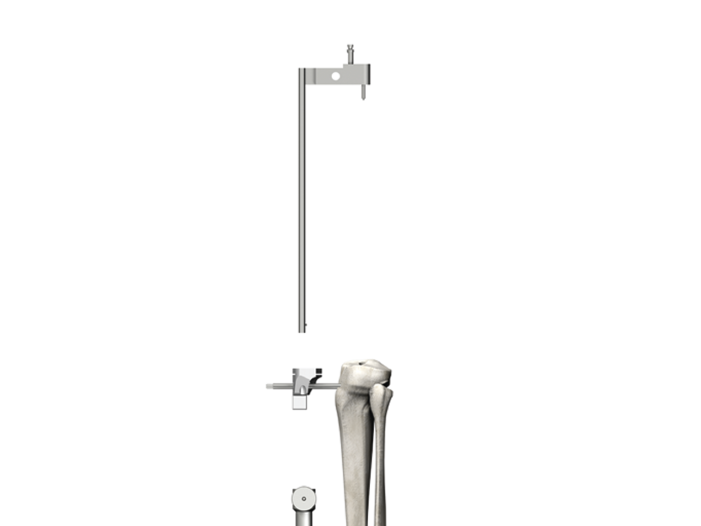 The mounting bar is pulled toward the surgeon, and the jig is rotated until proper varus/valgus orientation is achieved (Figure 63). Once the alignment rod is centered over the ankle, the Locking Knob is securely tightened. Once the alignment plane is centered over the ankle, Locking Knob is securely tightened. 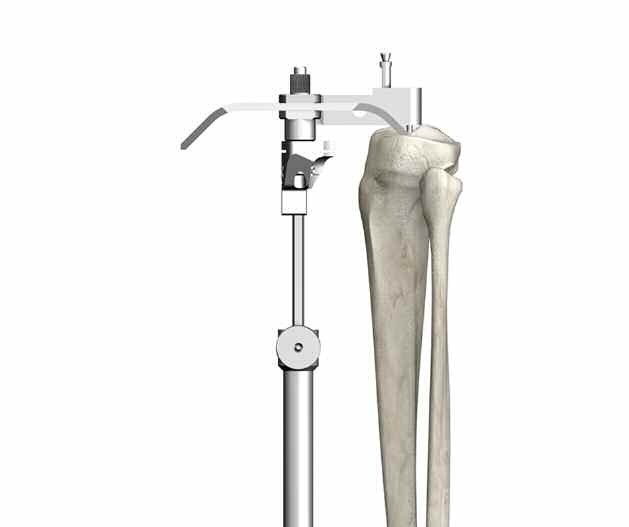 This double rod method establishes the plane of tibial alignment so that the flexion and rotation of the tibial component does not introduce an alignment error. 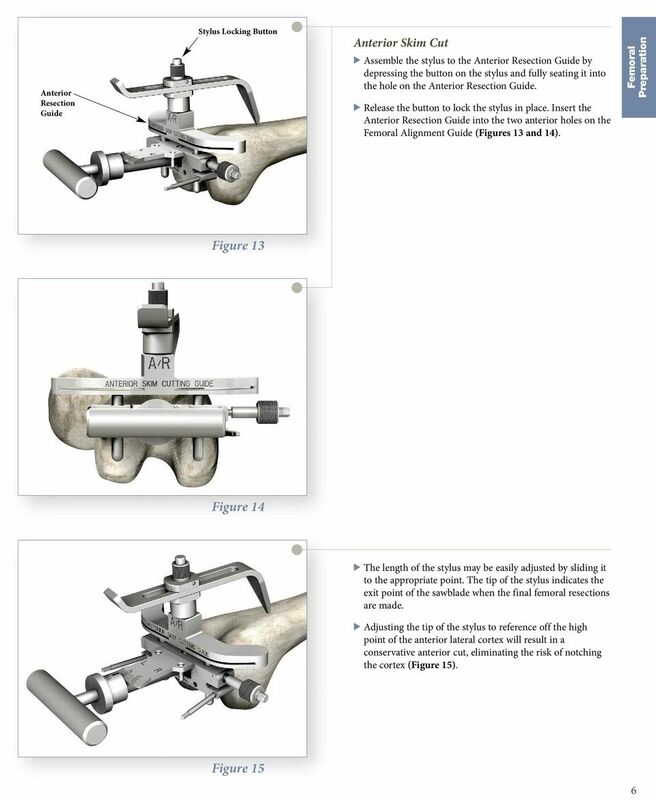 Ormonde Mahoney, MD Figure 63 Locking Knob 2 Flexion/Extension Alignment > If additional posterior slope is required, loosen Locking Knob 2 and set the slope. Once the correct slope is attained, securely tighten Locking Knob 2 to set the final position of the jig (Figure 64). > Increment markings have been added to the posterior slope adjustment FOR REFERENCE ONLY. Bear in mind that these are reference marks only and not indicative of an exact measurement of the posterior slope of the tibial resection. 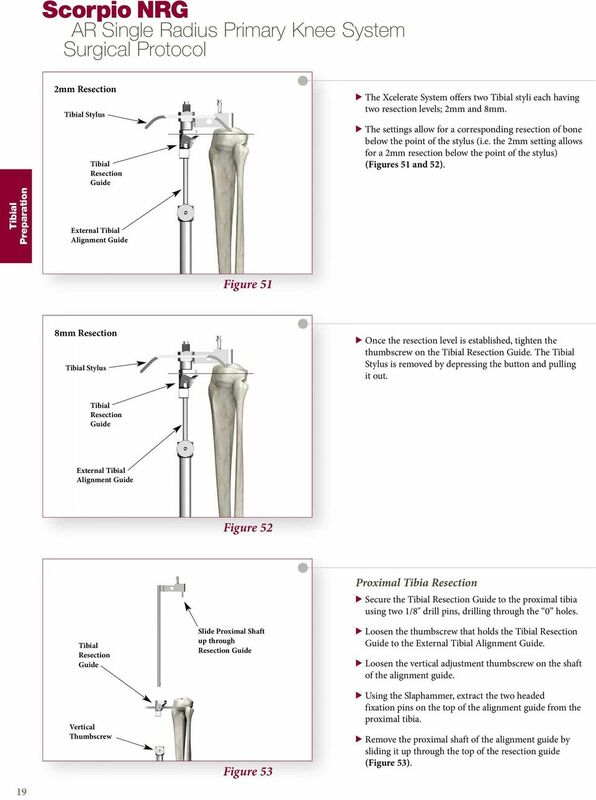 The true slope is dependent on many factors, including, but not limited to, tibial anatomy, the placement of the IM Rod, the position of the cutting block from the anterior portion of the tibia. 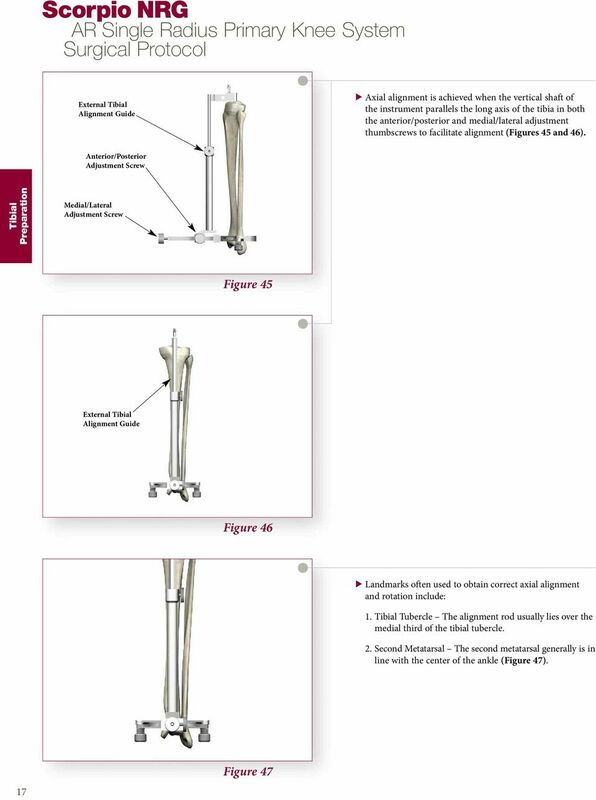 Figure 64 Resection Level > The Xcelerate System offers Right and Left, 0 and 5 Resection Guides. 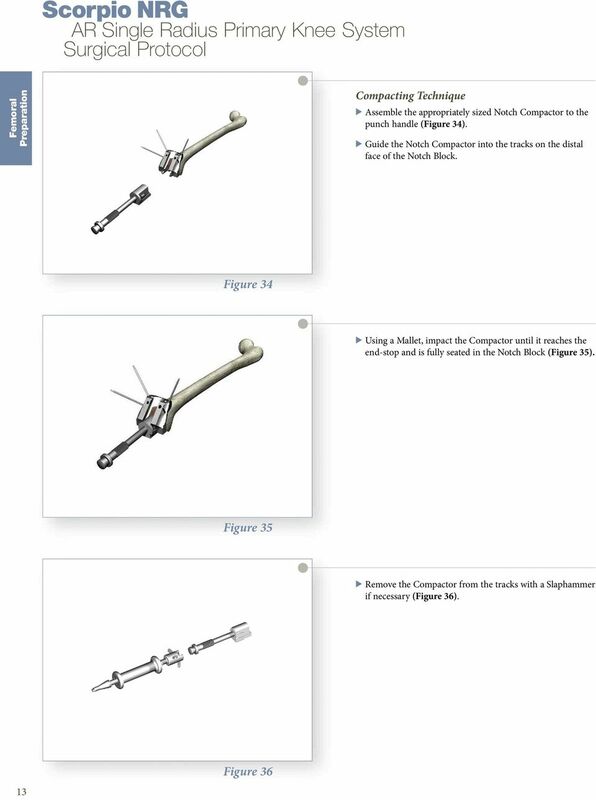 23 Locking Botton Stylus Resection Guide Thumbscrew Figure 65 Note: 0 degrees of posterior slope is recommended for use with the Scorpio PS femoral components. 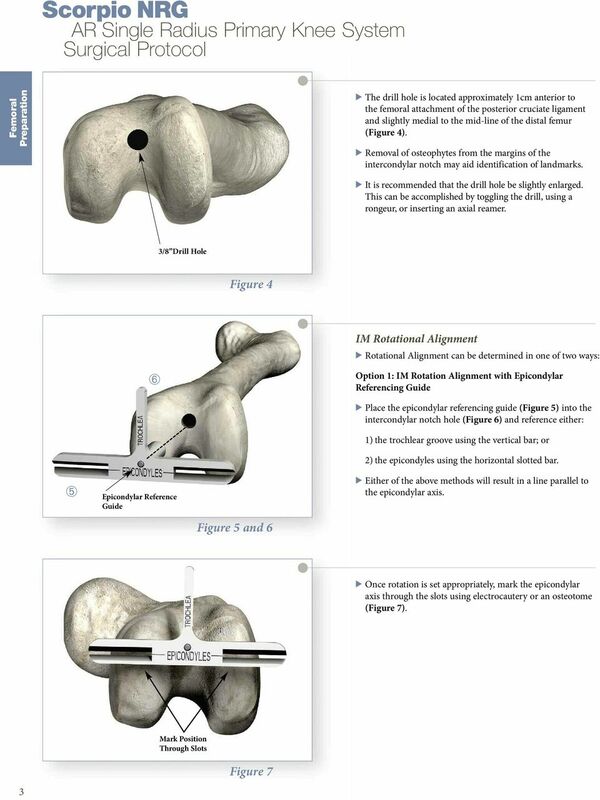 5 degrees of posterior slope is recommended for use with the Scorpio CR femoral components. > Assemble the Stylus onto the Resection Guide by depressing the button on the top of the Stylus, inserting the stylus into either the medial or lateral hole on the top of the Resection Guide, and releasing the button to lock the stylus into place (Figure 65). Note: The components shall be positioned to avoid excessive hyperextension. 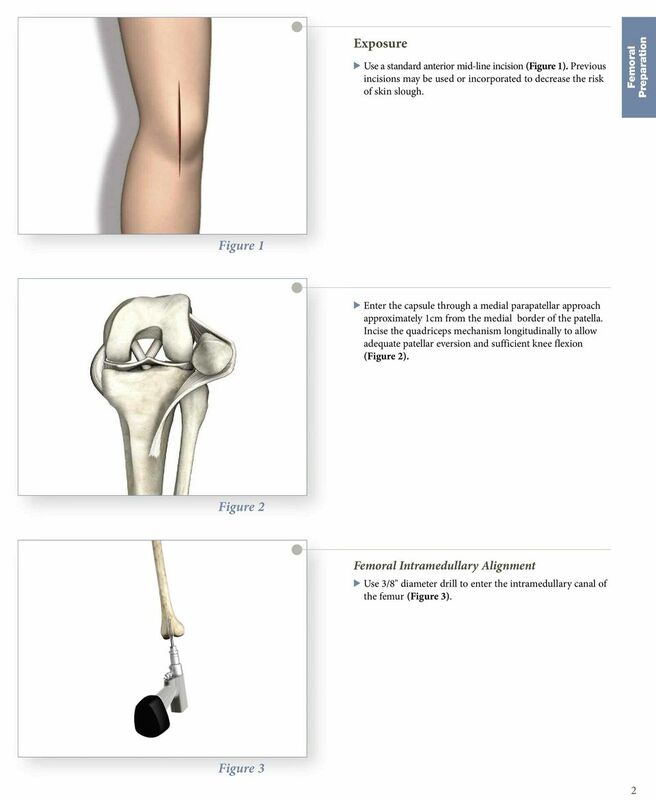 Excessive femoral flexion and tibial slope should be avoided when implanting the components. Implant positioning resulting in excessive hyperextension may result in premature wear and damage to the implant. 38 Scorpio NRG AR Single Radius Primary Knee System Surgical Protocol Indications Painful, disabling joint disease of the knee resulting from: degenerative arthritis, rheumatoid arthritis or post-traumatic arthritis. Post-traumatic loss of knee joint configuration and function. Moderate varus, valgus, or flexion deformity in which the ligamentous structures can be returned to adequate function and stability. 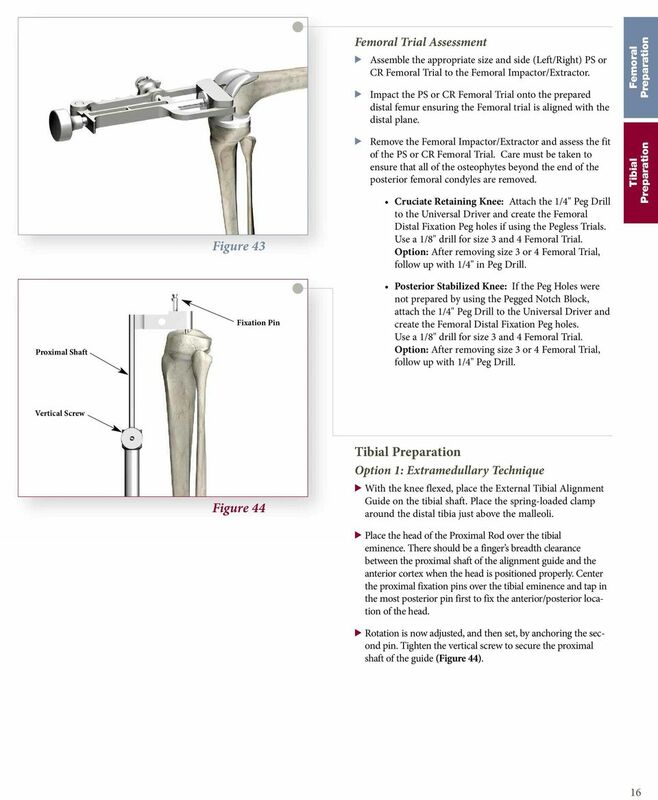 Revision of previous unsuccessful knee replacement or other procedure. 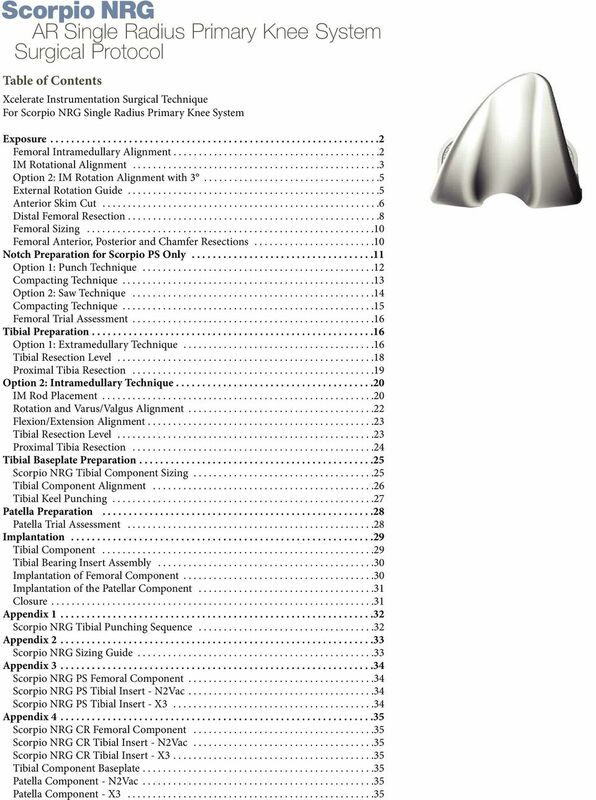 Additional Indications for Posterior Stabilized Components: Ligamentous instability requiring implant bearing surface geometries with increased constraint. 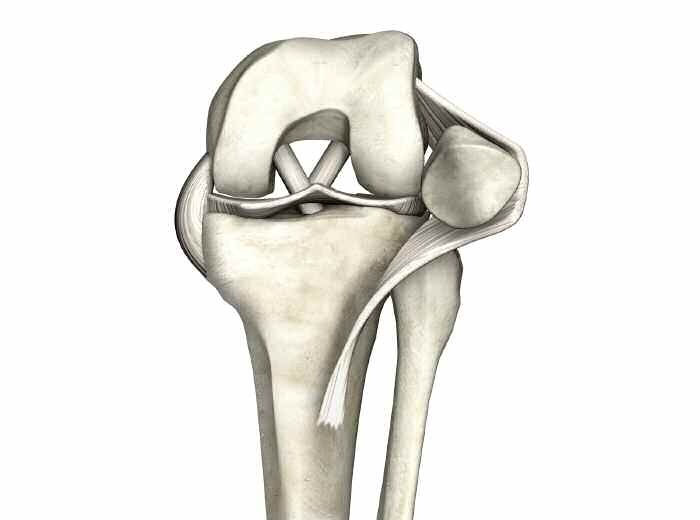 Absent or non-functioning posterior cruciate ligament. Contraindications Any active or suspected latent infection in or about the knee joint. Any mental or neuromuscular disorder which would create an unacceptable risk of prosthesis instability, prosthesis fixation failure, or complications in post-operative care. 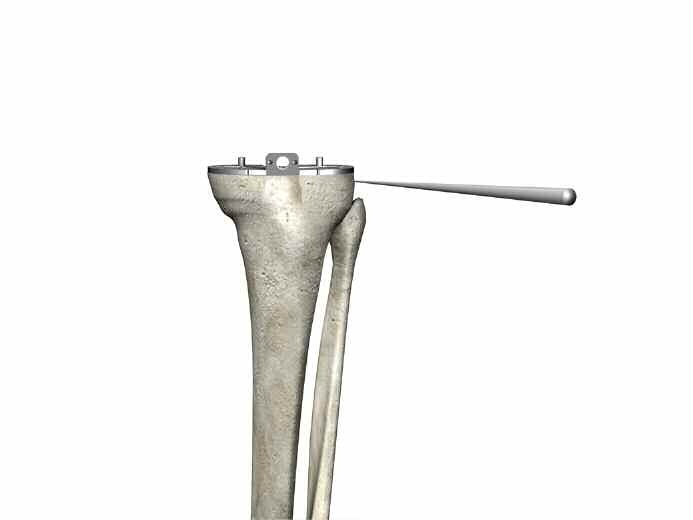 Bone stock compromised by disease, infection or prior implantation, which cannot provide adequate support and/or fixation to the prosthesis. Skeletal immaturity. Severe instability of the knee joint secondary to the absence of collateral ligament integrity and function. Obesity. An overweight or obese patient can produce loads on the prosthesis which can lead to failure of the fixation of the device or to failure of the device itself. Warnings and Precautions: See package insert for warnings, precautions, adverse effects and other essential product information.